The formal launch with Alex Jones, Managing Director of First Essex, holding the scissors. Neil Banks, Head of Passenger Services at Stansted Airport is to his left and Ray Howard, Essex County Council, Deputy Cabinet Member for Highways and Transport to his right. 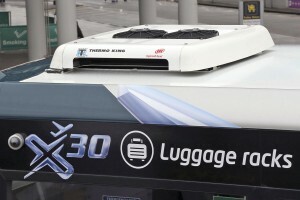 Roof mounted Thermo King air chill unit. 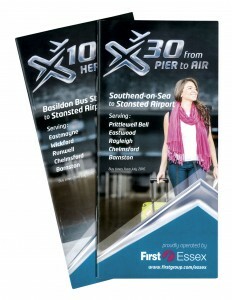 In 2004, First introduced its X30 coach service across Essex linking Southend with Stansted Airport in partnership with the airport and Essex County Council. Initially operated with Plaxton Cheetah Midicoaches, full size coaches were soon required and wheelchair lift equipped Volvo B9R Plaxton Panthers took over. The same partners added the X10 route that runs from Basildon to Stansted Airport via Wickford, Chelmsford, Barnston and Stansted in July 2016 and both routes have now been treated to a full makeover with new vehicles and branding as part of the minimum four year partnership. 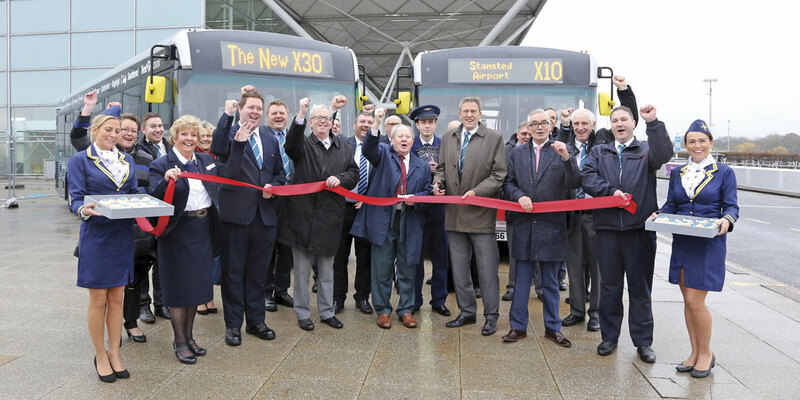 The new image was launched at the beginning of this week on Stansted’s forecourt, the heavy rains drenching most of southern England pausing just long enough for the formalities in front of two of the new vehicles. Neil Banks, Head of Passenger Services at Stansted Airport referred to the airport being the largest in the UK for public transport use and looked forward to further co-operative working with First into the future. Speaking with Neil later, he was committed to providing high quality public transport facilities, providing airport access only to service providers that upheld the values of M.A.G., the airport’s parent company and emphasising, ‘We don’t want to put passengers on services we are not happy with.’ Neil stressed the importance of growing public transport usage at Stansted further, particularly amongst the airport’s workforce for whom a discounted travel scheme had been introduced. 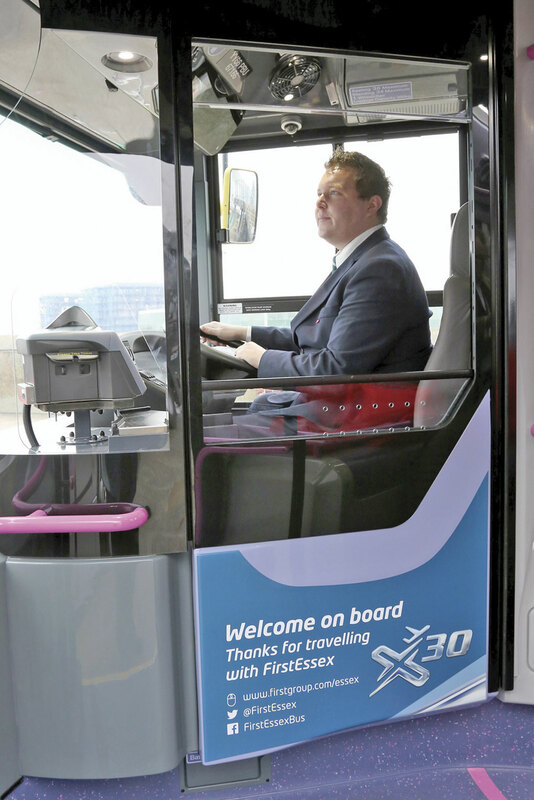 For Essex County Council, Deputy Cabinet Member for Highways and Transport, Ray Howard described the rebranded services as ‘partnership working at its best’ and was greatly encouraged by the projected 7000 passengers a week usage. 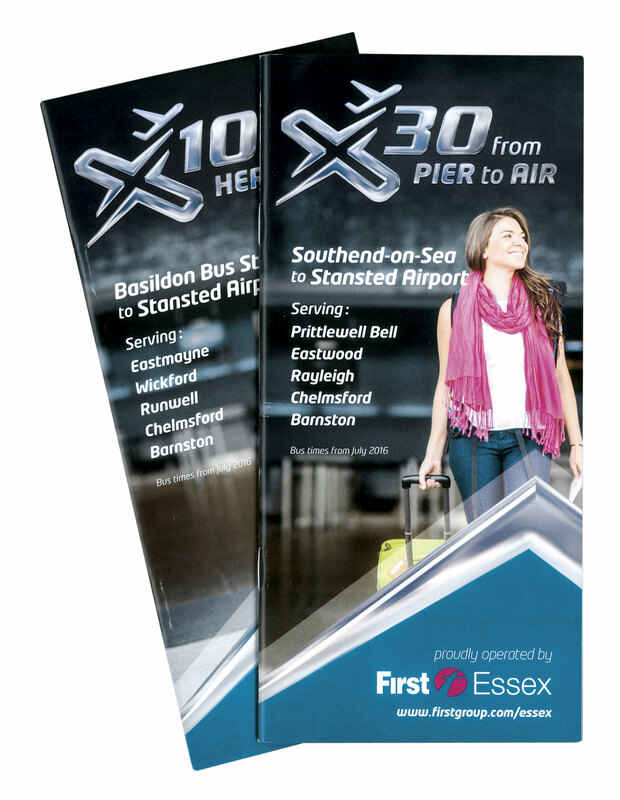 Combining to provide a 30 minute frequency between Stansted Airport and Chelmsford, the X10 and X30 provide hourly links to Basildon and Southend respectively, serving principle communities en route. The service operates round the clock with a short break in the early hours of the morning. The rebranding package has been developed for First and its partners by Manchester based design consultancy JR Buzz. 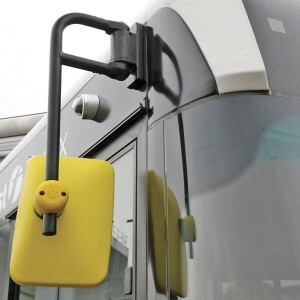 The package they have delivered includes internal and external vehicle colour schemes, graphics, cove panel advertising, timetable booklets and bus stop display material. The design builds strongly on the airport’s silver and blue house colours blended with First’s current schemes. Not only have the X10 and X30 been rebranded but the operational concept has changed with low floor buses incorporating luggage racks and a manual ramp replacing the high floor coaches previously used. First reported that the service has seen growing numbers of wheelchair users boarding and the new vehicles will significantly improve and speed up their accessibility. 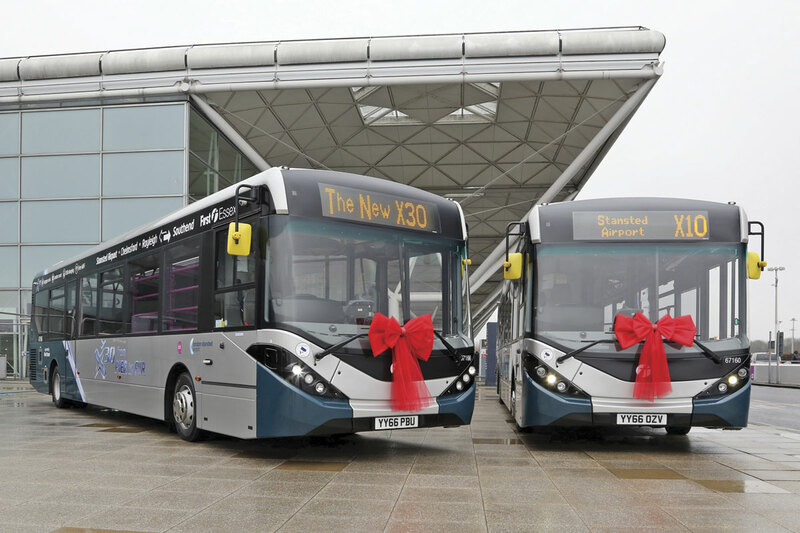 £1.9m has been invested in 12 11.5m ADL Enviro200s with features based on feedback from the partnership and the services’ operational teams. 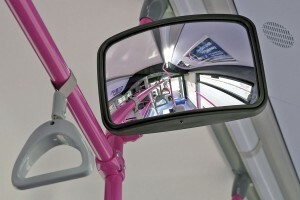 In addition to the offside racks that offer 360kg luggage capacity, the buses have a large glazed panel in the drivers cab screen that can be fully lowered to maintain the direct customer interface established by the coach operation. In anticipation of the better weather conditions that the operating area normally enjoys, an air chill system using a roof mounted Thermo King unit is installed and additional tinting has been applied to the top corners of the windscreen. 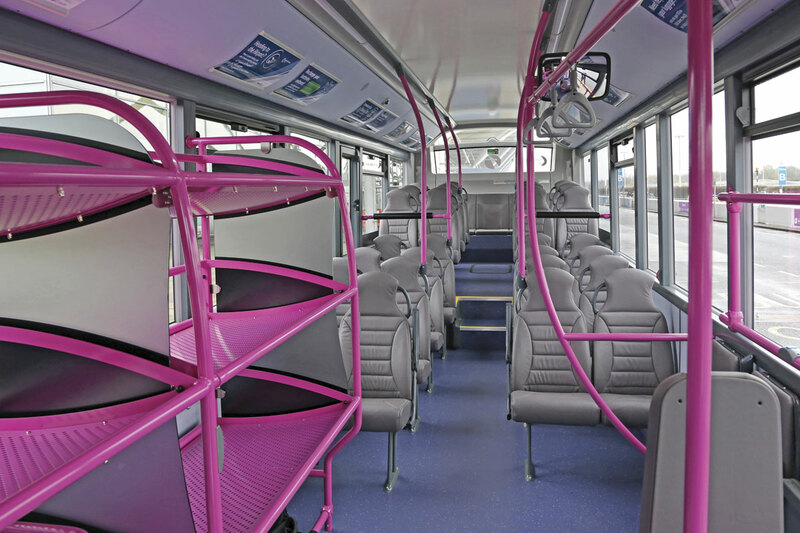 The interior features 36 seats, including three tip ups in the wheelchair bay, and has capacity for 34 standees proving improved flexibility in capacity provision at peak load times. The regular seat pairs are the Practico from Lazzarini and all seats feature double padded backs and squabs trimmed in real leather from Muirhead. An internal and external camera system and USB charging points are installed with Wi-Fi offered to customers. Recognising the intensity of the operation with some diagrams covering over 600 miles daily, the Euro6 Cummins ISBe 4.5 litre powered low carbon vehicles are fitted with long range fuel tanks and a low fuel warning buzzer.